There are so many pictures and artistic renderings throughout this book that it is frighteningly difficult to absorb it all at once. There are photographs from the very beginning, including pieces from the early Chainmail rule book and photos of the old Grey House, as well as an original draft of the first Dungeons & Dragons rule book. Starting in the first chapter is also an interesting look at the artistic metamorphosis of certain monsters and creatures throughout the decades. These include Purple Worms, Demogorgon, Dragons, Lolth, Mindflayers, and many more. 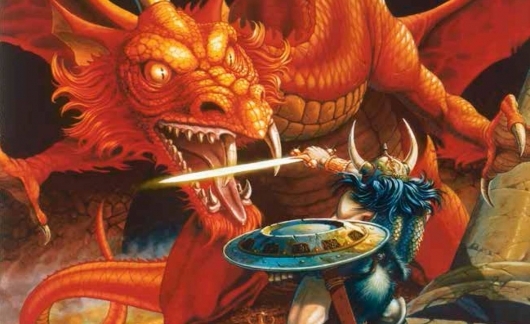 There are entries showing Dragon magazine covers, advertisements from yesteryear, and a plethora of notes and articles reflecting both the positives and the negatives of the how D&D was portrayed in the past. There are hundreds upon hundreds of fantastic art pieces for your enjoyment herein. My big three were always Larry Elmore, Jeff Easley, and Clyde Caldwell. Their contributions over the years really influenced my own art. In fact, I have had a few chances to meet these amazing artists in the past. 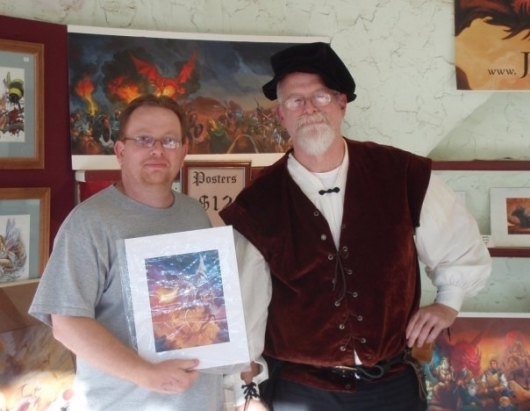 Unfortunately, I only have one surviving photograph, but it is one I will treasure forever; it is me and Jeff Easley at the Texas Renaissance Festival ten years ago. And because this is my article, I get the pleasure of showing you! This is not even a humble-brag, I’m straight up showing off. I think the most amazing part of this book is how we see the growth of not just the game and the mechanics of it all, but how it was represented and how much passion and love went into the art to support this amazing game. Dungeons & Dragons is easily the most recognizable role-playing game ever. Without this wonderful tabletop system, we might never have seen the industry grow to the level it has. And while the game itself was and is spectacular, the drawings and paintings within were always awe-inspiring and definitely stirred our creative juices. I mean, who would not want a depiction of their player character, right? More than 400 pages and the most comprehensive collection of D&D art ever assembled is no small feat. I saw ads I have not seen in thirty years, module covers that remind me of things I bought when I first started playing, character sheets that changed with almost every edition released, and so on and so forth. View-Master slides, coloring books, cartoons, movies, and more. The list is seemingly endless, friends. And with all that nostalgia comes the memories of friends and fellow gamers. There are some still with us like Keith, Stephen, Shea, and the rest. But there are others who have passed on to another plane like my old roommate, Pat (rest in peace, buddy). For those of us who were not popular or part of huge circles of friends, this was our bonding time. These were our people. The artists who illustrated these wonderful books and magazines reminded us that we were not alone, that we all shared a common bond. And whether your jam was Greyhawk, Forgotten Realms, Dragonlance, Dark Sun, Spelljammer, or Ravenloft, there was always something that would appeal to players. I know I strayed from the focus on the art of this book, but I have always felt that the core of the game was imagination and that the beautiful paintings and skillful sketches were the truest impression of what Dungeons & Dragons embodied. No one thinks alike or sees a visualization of the written word in the same way. But thanks in no small part to the multitude of artists featured here, we all at least had a shared vision as a starting point. 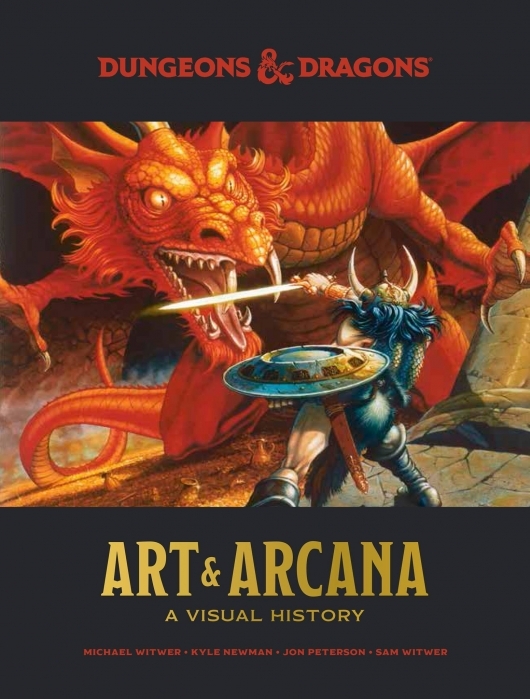 The history in Art & Arcana makes it an inevitable purchase for the true Dungeons & Dragons fan. It is a celebration of the love and zeal that we have for this iconic game that has helped spawn a thousand clones, but never a true competitor, not really. I managed to write this and never once had to reference Stranger Things, how about that?